More and more, people don’t buy the past or the present, they buy the future. Especially in software. And the trajectory is the best estimate of the future. The recent Gartner Magic Quadrant for Business Intelligence and Analytics Platforms is yet another example of the new Trajectory Economy. The entire BI landscape has completely reshuffled in a very short amount of time, mainly due to trajectory. It seems like this kind of thing is repeating in many other areas of software as well. The ERP market moves A LOT slower than the BI market, but, personally, I think we are going to see Acumatica follow a similar path as Power BI because trajectory is becoming more and more important in the software market. You could also say “velocity” instead of “trajectory”. When I took calculus in high school, we referred to “velocity” as the “derivative”. If you took the “derivative” twice, then it was referred to as “acceleration” which honestly gives me a headache. Bottom line, I think that “where you are going” is becoming a lot more important in enterprise software than it used to be. “Where you are” is still the most important because enterprise software is used to run real businesses in the present (like, right now) and the software needs to be industrial strength, more than just “work” in an academic way. But “where you are going” is becoming increasingly important, especially as software development becomes more agile and time to market is reduced by not having to reinvent the wheel so many times. Of course, this helps Acumatica right now because the “Acumatica trajectory” is really good and there isn’t any real Midmarket ERP competition on the horizon. Any Midmarket company considering a new ERP product would be crazy not to look at Acumatica. Because of this, it seems that the current Acumatica growth trajectory will continue for at least another year until a competitor appears. So Acumatica definitely benefits from the “trajectory economy” as do many other modern software companies, but I wonder who benefits more from the “trajectory economy”. Do companies? Do employees? At first glance, I would say that employees benefit more because of their ability to “pivot”. It takes much longer for a company to bring a software product to market than it does for employees to learn it. So if a new product emerges, the employee has the ability to learn it and move on whereas the company is stuck with its existing product. It seems that the employee, what Peter Drucker calls the “knowledge worker”, has the advantage here. The key to this advantage is the employee’s ability to learn new things. And this is where I think we can again apply the word “trajectory”. The employee’s learning trajectory is very important and it is why I personally will always consider myself a “learner”, never “an expert”. As soon as you see yourself as an expert, your trajectory goes flat. You can work really hard, but it’s like trying to launch a rocket horizontally rather than vertically. 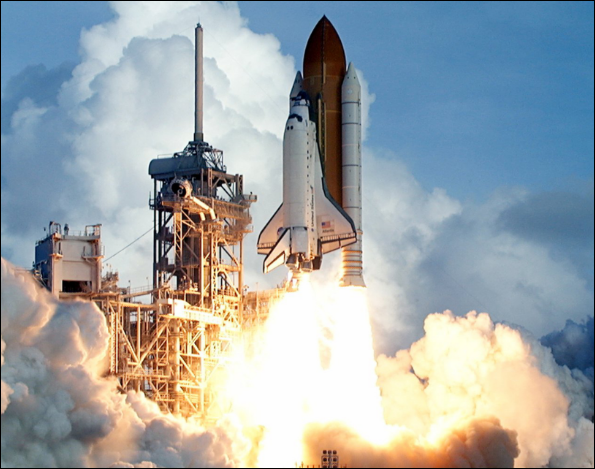 You can have a lot of “thrust”, “propulsion”, etc., but unless you have “trajectory” your launch will be disastrous. All of the new software products are like tools in the toolbelt of the knowledge worker. The real skill is knowing how to use the tools and when to use specific tools in specific situations. This is not an easy task, but it can be fun. A plumber knows how much easier life can be when you use the right tool for the job, Batman knows the importance of having plenty of available options in his utility belt, and Craftsman understands that a good worker knows the value of a good tool. The tool is important, but the wielder of the tool, I daresay, is even more important. Best of breed has encroached upon the ERP market and recently even accelerated the pace. Now it isn’t as common to see a company attempt to put all of their digital eggs in one basket. They can bring in multiple software solutions for specific needs and tie things together with a BI solution. I think that a big reason why this has become popular is because of the BI solutions themselves. They have gotten a lot better. And since BI tools don’t really care where the data comes from and they have the ability to easily combine data from multiple sources, best of breed is probably going to be a trend that we will continue to see for quite some time. The idea of an ERP blockchain might accelerate this even more. I first learned about this idea from Jon Reed and it is very interesting. Think BitCoin applied to Accounting. Accounting has always had one central ledger where everything is recorded. This is a fundamental idea in the design of ERP in that everything flows into the General Ledger, the final resting place, the single source of financial truth for the company. But BitCoin operates on the idea that there is no single source. The “source” exists all over the place in redundant fashion. I personally don’t completely understand how it works and I don’t know if something as sensitive as a company’s financials could exist securely in such a design, especially when stock prices depend on it, but it’s an interesting idea. If it does gain momentum, I could see BI becoming even more important in the future world of ERP because the data sources would be even more disparate. Wherever things go next, it seems that they will get there at an ever increasing pace in the trajectory economy. But I personally like to focus on reporting when it comes to ERP because I think it puts me in a good position. There are tons of BI tools available today. I don’t need to think of my ERP data as one data source since I can easily tie multiple data sources into one model (which is actually preferred) and then deliver information to a decision maker which is probably one of the main reasons why they bought a new ERP system in the first place. To conclude, thanks to Acumatica and Power BI for giving us some really cool tools in our toolbelt. Though the world around us continues to change at an ever increasing pace, I think that we knowledge workers are in a pretty good position and I look forward to the journey ahead.